Not to be confused with Goose Goslin. Richard Michael "Goose" Gossage (born July 5, 1951) is a former Major League Baseball right-handed relief pitcher. 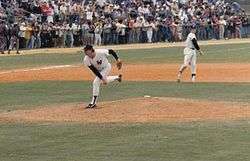 During a 22-year baseball career (from 1972–1994), he pitched for nine different teams, spending his best years with the New York Yankees and San Diego Padres. The nickname "Goose" came about when a friend did not like his previous nickname "Goss", and noted he looked like a goose when he extended his neck to read the signs given by the catcher when he was pitching. 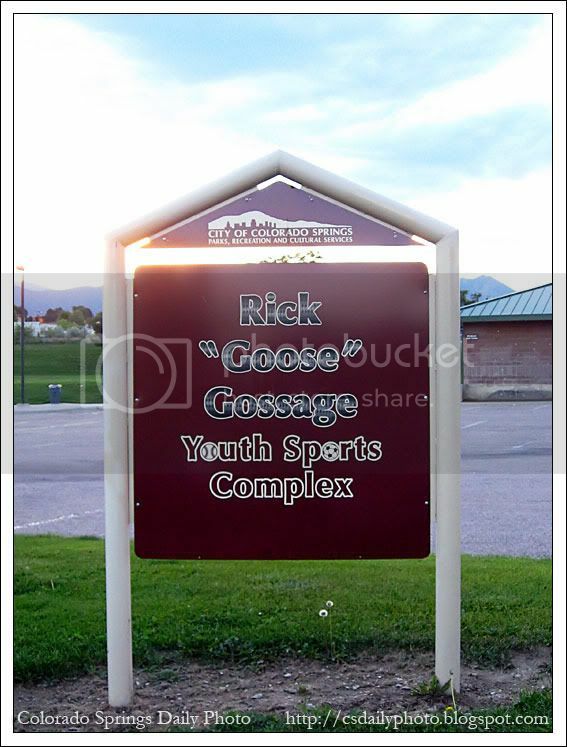 Although Gossage is otherwise generally referred to as "Rich" in popular media, a baseball field named after him bears the name "Rick." Respected for his impact in crucial games, Gossage recorded the final out to clinch a division, league, or World Series title seven times. His eight All-Star selections as a reliever were a record until Mariano Rivera passed him in 2008; he was also selected once as a starting pitcher. He was elected to the Baseball Hall of Fame in 2008. He now works in broadcasting. Gossage attended Wasson High School in Colorado Springs, Colorado. The Chicago White Sox selected him in the ninth round of the 1970 MLB draft. He missed some of the 1979 season with the Yankees with a thumb injury sustained in a locker-room fight with teammate Cliff Johnson. Ron Guidry, the reigning Cy Young Award winner, volunteered to go to the bullpen to replace him. In the first game of a doubleheader on October 4, 1980, Gossage pitched the last two innings of a 5-2 win over the Detroit Tigers, earning his career-high 33rd save as New York clinched another division title. On October 10, George Brett of the Royals hit a tide-turning three-run homer off Gossage into Yankee Stadium's right-field upper deck to lead the Royals to a three-game sweep in the AL Championship Series, after the Yankees had defeated the Royals in three consecutive ALCS from 1976 to 1978. Almost three years later during the regular season, Brett got to the Goose again in the Bronx, blasting a go-ahead two-run home run in the top of the ninth in a game memorialized as the "Pine Tar Game." Gossage became upset with Yankees' owner George Steinbrenner for meddling with the team. In 1982, he called Steinbrenner "the fat man upstairs", and disapproved of the way Yankees' manager Billy Martin used him. Gossage became a free agent after the 1983 season, and insisted that he would not resign with New York. He signed with the San Diego Padres. In 1984, Gossage clinched another title, earning the save in Game 5 of the NL Championship Series and sending the Padres to their first World Series; after San Diego had scored four runs in the seventh inning to take a 6-3 lead against the Chicago Cubs, Gossage pitched the final two innings, getting Keith Moreland to hit into a force play for the final out. On August 17, 1986, Gossage struck out Pete Rose in Rose's final major-league at bat. Before the 1988 season, the Padres traded Gossage and Ray Hayward to the Cubs for Moreland and Mike Brumley. On August 6, 1988, while with the Cubs, Gossage became the second pitcher to record 300 career saves in a 7-4 victory over the Philadelphia Phillies, coming into the game with two out in the ninth and two men on base and retiring Phil Bradley on a popup to second baseman Ryne Sandberg. Released by the Cubs in March 1989, he signed with the San Francisco Giants in April. The Yankees selected Gossage off of waivers in August. He pitched for the Fukuoka Daiei Hawks of Nippon Professional Baseball in 1990. Gossage and top relievers of his era were known as firemen, relievers who entered the game when a lead was in jeopardy—usually with men on base—and regardless of the inning and often pitching two or three innings while finishing the game. Gossage had 17 games where he recorded at least 10 outs in his first season as a closer, including three games where he went seven innings. He pitched over 130 innings as a reliever in three different seasons. He had more saves of at least two innings than saves where he pitched one inning or less. The ace reliever's role evolved to where he was reserved for games where the team had a lead of three runs or less in the ninth inning. Mariano Rivera, considered the greatest closer of his era, earned only one save of seven-plus outs in his career, while Gossage logged 53. "Don't tell me [Rivera's] the best relief pitcher of all-time until he can do the same job I did. He may be the best modern closer, but you have to compare apples to apples. Do what we did", said Gossage. In 1999, editors at The Sporting News ranked Gossage 89th on their list of "Baseball's 100 Greatest Players". His son Todd is a professional baseball player who has played for the Sussex Skyhawks, Newark Bears, and Rockland Boulders of the Can-Am League. ↑ "Chat: Chat with former pitcher Goose Gossage – SportsNation – ESPN". Espn.go.com. Retrieved 2014-04-14. ↑ "Famers on the Fringe". ESPN.com. Retrieved 2008-08-01. ↑ Mitchell, Fred (1988-02-13). "Cubs Deal Moreland For Gossage – Chicago Tribune". Articles.chicagotribune.com. Retrieved 2014-04-14. ↑ "The feared fastball is gone, and so is 'Goose' Gossage.". The Daily News. AP. 29 March 1989. Retrieved 27 December 2014. 1 2 Alfonso L.; Tusa C. (27 October 2011). "Rich Gossage-SABR". SABR Baseball Biography Project. Society for American Baseball Research. Retrieved 27 December 2014. After one year in Chicago, "experimenting with off-speed pitches to compensate for a diminished fastball," he was released. The 1989 season featured a stop with the San Francisco Giants and a brief return to the Yankees. ↑ Philip, Tom (April 30, 2011). "Blown saves are overblown". ESPN.com. Archived from the original on January 5, 2012. ↑ Zimniuch, Fran (2010). Fireman: The Evolution of the Closer in Baseball. Chicago: Triumph Books. p. 98. ISBN 978-1-60078-312-8. ↑ Schechter, Gabriel (March 21, 2006). "Top Relievers in Trouble". National Baseball Hall of Fame and Museum. Archived from the original on June 8, 2007. ↑ Jenkins, Chris (September 25, 2006). "Where's the fire?". The San Diego Union-Tribune. Archived from the original on February 25, 2011. 1 2 Caple, Jim (August 5, 2008). "The most overrated position in sports". ESPN.com. Archived from the original on February 25, 2011. ↑ Schecter, Gabriel (January 18, 2006). "The Evolution of the Closer". National Baseball Hall of Fame. Archived from the original on June 8, 2007. Sutter and Gossage had more saves where they logged at least two innings than saves where they pitched an inning or less. ↑ Baseball Prospectus Team of Experts (2007). Baseball Between the Numbers: Why Everything You Know About the Game Is Wrong. New York: Basic Books. p. 60. ISBN 978-0-465-00547-5. Retrieved February 23, 2011. ↑ Red, Christian (March 13, 2010). "Modern Yankee Heroes: From humble beginnings, Mariano Rivera becomes the greatest closer in MLB history". Daily News. Retrieved December 2, 2011. ↑ Rosen, Charlie (2011). Bullpen Diaries: Mariano Rivera, Bronx Dreams, Pinstripe Legends, and the Future of the New York Yankees. HarperCollins Publishers. p. 213. ISBN 978-0-06-200598-4. ↑ "The Official Site of The New York Yankees: News: Goose not a fan of Joba's celebrations　". MLB.com. Retrieved 2008-09-04. ↑ "07082009.jpg Photo by TameraGoldsmith | Photobucket". Media.photobucket.com. Retrieved 2014-04-14. ↑ "100 Greatest Baseball Players by The Sporting News : A Legendary List by Baseball Almanac". Baseball-almanac.com. Retrieved 2014-04-14. ↑ "'Storybook career' leads Goose to Hall | MLB.com: News". Mlb.mlb.com. 2014-03-27. Retrieved 2014-04-14. ↑ "Yankees to honor Joe Torre, Rich "Goose" Gossage, Tino Martinez, and Paul O'Neill in 2014 with plaques in Monument Park; Torre's uniform no. 6 to also be retired: Ceremonies are part of a recognition series that will include Bernie Williams in 2015". MLB.com (Press release). May 8, 2014. Retrieved May 8, 2014.